Katie and Tommy met after he read a blog she posted and messaged her on Facebook. They married in 2016. “You’re going where? To see who exactly?” Those were my mother’s words when I told her I was flying to Pennsylvania to see a man named Tommy I had met on Facebook a few weeks prior. “Well, who is this guy? What do you know about him?” my father asked, as I’m certain he simultaneously called his FBI friends to order a comprehensive background check on this man I’d met on the Internet. This guy I met on Facebook was everything my parents had prayed for me to find someday, and more. He was what they wanted for me and they couldn’t wait to see us begin our married life together. For the two people who have the best marriage I know of to give us their blessing, and support us throughout our preparations for and in these first few months of marriage, has been a remarkable gift. To know that their support and love flows from their own lived experience of a healthy, holy marriage makes it all the better. My whole life I have admired my parents. Their unwavering faith, uncompromising work ethic, and undeniable joy and playfulness is the very heart of our family. I always knew one thing without question: my mom and dad loved each other, and everything in their lives flowed from and through their relationship. It was never a question of if my folks were in love. It was merely a matter of how much they loved each other and what new way they would find to show that love each day. Whether it was the weekly flowers my dad had delivered to mom’s office, or the sticky notes my mom would leave for my dad on his briefcase, there were constant reminders to my sister and me that our parents cared deeply for each other and allowed that love to radiate into every aspect of our home. It wasn’t uncommon to see them holding hands or to hear dad tell mom she was beautiful. They’d often go out to dinner, just the two of them, leaving us home with a babysitter, rented movies, and pizza. It wasn’t that they didn’t want to be with us; it was just immensely important that they be together on their own as well. A few years ago, they decided to go on a week-long trip in my mom’s convertible, running the roads from Louisiana to North Carolina like a couple of newlyweds. The pictures from that vacation – and their stories of getting lost in middle-of-nowhere-Georgia – were proof that their love had only deepened over the years. 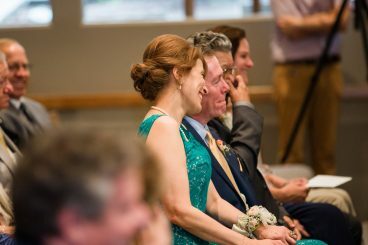 In the days leading up to our wedding, as we would all talk through the little details, my dad would tease me, saying, “I’m sure your wedding dress is beautiful, Katie, but your mom looks great in what she’ll be wearing!” Even after all these years, my dad still thinks my mom is stunningly gorgeous and will tell anyone who will listen. This month marks 32 years of marriage for my folks. That’s 32 years of working together, praying with and for each other, and supporting each other in good times and bad. 32 years of setting goals, making sacrifices, and learning the lessons of life. 32 years of growing more and more in love each day and witnessing to that love. 32 years of being a steady example of how to serve another and root a relationship in Christ. 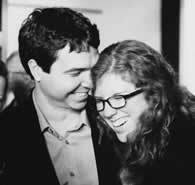 Our twelve weeks of newlywed bliss (and our fair share of struggles) seem to pale in comparison to the numerous years of marriage of all the couples we’ve been blessed to know. Between our parents, grandparents, aunts and uncles, cousins, coworkers, friends, and mentors, there are hundreds of years of married life that we’ve seen, admired, and hope to emulate. The common thread running through each marriage we’ve been blessed to observe is simple: love only grows. Love doesn’t shrink in the face of sacrifice or dwindle day by day. Love changes. It shifts. It morphs when confronted with challenges and struggles, and it deepens in moments of success and joy. In the end, the love in marriage seems to grow and expand when a couple stands together and tackles life in the name of the Lord. In fact, I’d go so far as to say that it’s because of various struggles, and in the process of daily sacrifice, that love grows the most. And what is it that grows between a couple over twelve weeks, twelve months, or even 32 years and beyond? St. Paul tells us that love is patient. Love is not only happy go lucky feel good moments. It is patient, which means there are moments when calm, rational, deep breaths and level headedness is needed in the midst of the annoying habits of another person. Love is kind. Love is not merely nice. Niceness is bland and simple. It’s what we expect of children on playgrounds. But kindness – kindness is being gentle and compassionate, even when you don’t feel like it. Love is not jealous. Love is not competitive or spiteful. It is supportive, the ever present cheerleader in the face of daily jobs. Love isn’t rude nor does it seek to cut down. It isn’t this brooding, angry, spiteful thing. It is the enduring action by which a couple can forgive quickly and hope in a better tomorrow. Love is the unending, unfailing, never finished, constantly expanding glue between the newlyweds and the seasoned veterans. Love will move mountains, love will give meaning, and love will grow day by day within the couple that never forgets what it truly is: the very foundation of all that is said and done. As we continue to count each day of our marriage, our prayer is that we will continue to experience for ourselves what we have witnessed in the lives of the couples we know: that love will only grow between us as we grow together in virtue, strengthening and deepening day by day with our Lord.